RightNow Technologies announced their latest release this week, RightNow August ’08, and it includes some very cool features that pay tribute to their B2C roots. It is surprising how much new functionality and infrastructure this vendor continues to deliver with their challenging quarterly release cycle. For a complete list of what’s included you can read the press release, but allow me to highlight the pieces I was most excited about. I am working on a white paper regarding the importance of cross-enterprise workflow and visibility, enabling the support organization to proactively manage customer issues that must be resolved by a group outside of support. Interestingly, I am dealing with a hellish customer service problem in my own life regarding this exact same problem, and let me tell you, the worst thing you can tell a frustrated customer is that the problem is “beyond my control” and there is “nothing I can do to fix it.” Whatever happened to support as customer ombudsman? Customer support, in my mind, is the voice and face of the organization for customers. The majority of customer issues fall under the responsibility of the support organization, but unfortunately, not all do. 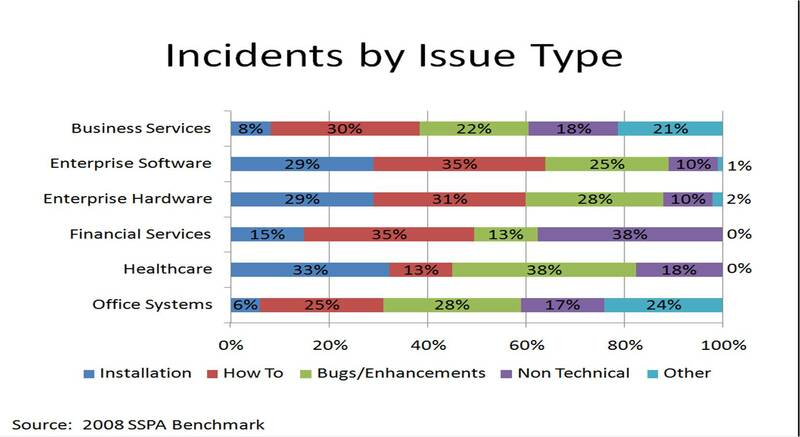 In the chart below, I have a breakdown of incidents by issue type from the SSPA Benchmark database. I admit I haven’t spent a lot of time on professional services automation (PSA) tools since my days at Giga, when all the enterprise CRM vendors seemed to release a PSA module at the same time. Though the enterprise apps vendors continue to deliver PSA modules, the biggest buzz around PSA today is for smaller, more agile PSA vendors, whose solutions most likely are delivered OnDemand/SaaS. You are currently browsing the Ragsdale’s Eye on Service weblog archives for August 2008.